Nicolas Maduro has a wonderful plan...nancial persecution" facing his country. He's... going to eliminate three zeros from his nation's currency. With it's oil industry collapsing, Venezuela now has to import oil . They're paying $80 or $90 a barrel for oil, and selling it at the pumps for $0. This is like something out of Atlas Shrugged. ... The long queues for food and medicine in Venezuela are now well documented, but lines of cars waiting outside petrol stations � something that would have been unthinkable a few years ago, when petrol cost $0.01 (0.7p) per litre � are becoming more common. Filling your tank is still cheaper than drinking water in Venezuela, but the industry can no longer meet domestic demands � and is having to put exports first. Monaldi says that if production continues to fall to below a million barrels, the consequences could be catastrophic. �The domestic consumption of oil is around 450,000 barrels and Venezuela needs the exports to repay its debt with Russia and China,� he says. �They have to import for two reasons. One is the collapse of the refining infrastructure and the other is that its oil is naturally heavy so they need to import diluents to blend with their oil to re-export it. Here's another socialist success. Venezuela is importing oil from the U.S. , paying $80 to $90 a barrel and selling it for $0. Venezuela has the world's largest proven reserves of petroleum. In 1998, when Bolivarian socialist Hugo Chavez was elected president, the country was producing about 3.5 million barrels of oil a day. As recently as 2013, when Nicolas Maduro ascended to the presidencey upon Chavez's death, the country was still pumping out about 2.8 million barrels a day. Since 2016, month daily production has dropped to 1.5 million barrels. Venezuela's heavy crude oil needs to be diluted with lighter petroleum products so that it can be refined into fuels. The Independent reports that as a result of the ongoing collapse of domestic refining, the South American country is now obliged to import about 200,000 barrels a day of diluents from the United States. The Venezuelan government sells gasoline at 1 cent per liter (80 cents in the U.S.). Even with the fanciful assumption that all the petroleum in a barrel could be refined into vehicle fuel, a rough calculation implies a value of $1.60 per barrel. The diluents from the U.S. cost about $80 to $90 per barrel. "One of the craziest things is that a part of Venezuela's imports is for the domestic market, but given its price, they practically give gasoline away for free," Francisco Monaldi, a fellow in Latin American energy policy at Rice University, tells The Independent. "They are importing barrels that cost $80 to $90 and selling them at $0." Despite Chavez's dysfunctional economic policies, Venezuela's GDP ascended along with oil prices during the first decade of the 21st century. But since peaking at $334 billion in 2011, the country's GDP has dropped to $215 billion. The economy shrank by 16 percent last year, and the International Monetary Fund projects it will shrink by another 15 percent this year. Inflation, meanwhile, is nearing an annual rate of 9,000 percent. Oil makes up more than 90 per cent of the nation's exports, but a combination of government corruption, lack of investment and the migration of qualified staff have left the industry in ruins. It's a crisis that has directly hit the country's ability to import resources like food or medicine for the Venezuelan population. This is what real socialism looks like. MARACAIBO, Venezuela (AP) � A month-long blackout in Jennifer Naranjo's neighborhood in the Venezuelan port city of Maracaibo leaves her anxious. She's eight months pregnant and passes hot, sleepless nights with no air conditioning, swatting away mosquitoes, worried about her unborn daughter's future. With air conditioners idle and daytime April temperatures often nearing 95 degrees Fahrenheit (35 degrees Celsius), families throw open their doors and windows to allow in any hint of a breeze � along with mosquitoes. Naranjo, 20, fears a bite could infect her and her daughter, Pamela, with the Zika virus, which has stricken about 70 of Maracaibo's infants with microcephaly, according to the local charity My Miracle Foundation, which supports children with the illness. The shortages are adding to the misery of a Venezuelan economic collapse on the scale of the Great Depression of the 1930s and as production in the oil industry � the largest consumer of power � has fallen to the lowest levels in decades. Nikki Haley says it\'s time for Maduro to go. U.S. Ambassador to the United Nations Nikki Haley called on Venezuelan dictator Nicol�s Maduro to step down on Tuesday, calling the elections scheduled for May 20 a "sham." She noted that Venezuelan migrants are causing a crisis in Latin America similar to the crisis of Syrian migrants in Europe, and that Venezuela's "implosion" represents a threat to Latin America. "The systematic oppression of the Venezuelan people has become an active threat to the entire region," Haley declared at a conference on Latin America at the State Department. "For the safety and the security of all people in Latin America, it is time for Maduro to go." He won't go until there's nothing left to loot. Late-stage socialism,Venezuela edition. There is a wave under way to seize the assets of Venezuela's state-owned oil company, because "No one wants to be last in line." ... The decision, which came amid the accelerating deterioration of Petroleos de Venezuela S.A.�s production capacity, could lead creditors to try to seize other Venezuelan assets abroad, including oil exports, to recover the more than $40 billion they claim they are owed. �Creditors are now saying to themselves, �Look, we now have confirmation that you can go out and embargo PDVSA,� and many of them are going to rush into court to ask for their own seizures,� said Antonio De La Cruz, executive director of Inter American Trends in Washington, D.C.
Nicolas Maduro has won another term as president of Venezuela. Not exactly a surprise. Nicol�s Maduro may have received more votes in Venezuela�s recent presidential election, but the record-low voter turnout is widely seen as its own form of protest against his increasingly oppressive socialist regime. So as long as Maduro�s government controls the voting process, his opponents will continue to advocate elections boycotts to try to erode the legitimacy of his government. Once again we see democracy being wielded as a weapon by tyrants, rather than an answer for political victims. The true challenge to Maduro�s regime will not come from elections, but rather the growing threat of a coup. While the political heir to Chavez has managed to keep the military loyal by allowing them to profit from cartelizing vital supplies, the continuing deterioration of the nation�s economy has sparked growing rebellion and desertion among the ranks. As Maduro�s government has continued to doubled-down on the same failed socialist policies that created one of the world�s gravest humanitarian crises, action by the military is increasingly seen as inevitable � including by the leaders of neighboring countries. Of course the destruction of Venezuela is not the result of a single man, and the issues plaguing the country will not simply disappear with his removal. So the question is what options realistically exist for a post-Maduro Venezuela, and what would those ramifications be for both its people and the rest of the world? A few years ago I looked at what Ludwig von Mises would recommend Venezuela do, drawing inspiration from his writings on post-World War I Austria. Policy recommendations included condemning the socialist ideology that destroyed the country, mass-privatization of the economy, abandoning the bolivar, and abandoning all trade restrictions. While these would still be the ideal tonic for what ills the country, even in the face of socialist ruin the intellectual climate of Venezuela is still far from the classical liberalism of Mises. This is demonstrated by the sad reality that the leading opposition parties, including Justice First, Popular Will, Democratic Unity Roundtable, and Democratic Action are a reaction to the violent crackdown and growing unconstitutional authoritarianism of Maduro�s government, rather than socialist ideology itself. In fact, all but Justice First still explicitly make socialist appeals in their political campaigns. The continued appeal of socialism among the public is so great that Henrique Capriles, a leading oppositional figure, called for a socialist-coalition as the best strategy to take down Maduro. So if the public will does not exist to embrace true market reforms, what options exist for the country? The first issue Venezuela faces is transitioning away from the bolivar that has become worth less than World of Warcraft currency thanks to Maduro�s hyperinflationary policies. The best recent example of transitioning away from such monetary chaos is Zimbabwe, which stopped printing its own worthless currency in 2009 and transitioned to using the US dollar at an exchange rate of $1 for Z$35,000,000,000,000,000. It�s possible that Venezuela could make a similar move � especially as US dollars are already circulating in what few markets still function in the country. Unfortunately this may not work quite as well in today�s Venezuela. If the Venezuelan people are not prepared to completely discard the personality cult of the late-Hugo Chavez, a full embrace of the American dollar may face complications � in part due to the US�s militarization of financial markets in recent years. While the pros may still outweigh the cons to formally adopting the dollar, there may be another option with unique appeal to Venezuela: the Chinese yuan. Even during the peaks of the oil boom, the Venezuela�s socialist economy relied greatly on the Chinese government. China is already Venezuela's biggest lender, and has already been forced to restructure payments with its largest investment in Latin America. Of course Venezuela is going to need more than debt restructuring to stabilize its financial situation. Given its aggressive desire to expand its global economic footprint, China may see potential in a broad Venezuelan bailout package � one that could include the country formally adopting the yuan. In 2015, the Mugabe government of Zimbabwe tried to make a big deal out of adopting the yuan as a legal currency in exchange for debt cancelation. The problem is that the announcement ignored that the yuan had already been legal currency dating back to 2009, and the debt forgiveness package was largely �a mirage.� This is understandable. Zimbabwe is of modest value to China outside of its use in projecting a growing global Chinese influence � with its tobacco industry the most lucrative trade the African nation has with its Eastern benefactor. Venezuela�s oil reserves, on the other hand, have long interested China�s Communist Party � and Maduro�s government already prices it in renminbi as a way to get around the US dollar. What if China offers a bailout package � including perhaps skilled workers to replace those that have fled the government-operated PDVSA � dependent on Venezuela receiving oil payments made in the yuan? Given how vital the oil economy is to Venezuela�s economy � making up 50% of GDP - renminbi would likely begin to quickly circulate through the Venezuelan economy in a way that hasn�t happened in Zimbabwe markets. Of course Venezuela�s hyperinflation is really a consequence of the country's larger economic evils: the destruction of economic productivity due to the nationalization of industry and an expensive welfare state. The rise of China is itself a testament to what even modest steps to market liberalization can do for a previously socialist economy. If Chinese support comes with stronger property rights than we see under Maduro � whose government recently nationalized a Kellogg�s plant � then this too would represent a positive step forward for Venezuelan citizens, even if it would reduce the country to more of a vassal state of China. While a Chinese bailout of Venezuela could offer desperately needed relief to the country, this third-way approach can�t go on forever � and China itself may end up being an illustration of this. For all the talk of China�s economic strength, the country has been forced to resort to overstating its own economic growth in recent years, and is very likely still doing so today. Even more troubling is China�s own reliance on debt to keep its economy growing. While lacking the massive welfare programs of Chavez and Maduro, China has been indulging in a decade-long debt binge with massive government spending on everything from infrastructure, industry, and island creation. While the strength of China�s government gives it significant power in kicking the can down the road, global officials � such as the Reserve Bank of Australia - are starting to get alarmed. The threat to China stems from the same reason that could make it attractive to a future Venezuelan government: their shared socialist ideology and belief in central planning. While China has long departed from the communist policies in Mao � even if Xi aspires for his degree of power � its continued reliance on government-centric five year plans and bloated state-run firms has created its own form of Keynesian nightmare. What China teaches us about economics and economic policy is the lesson that is generally not provided in college classrooms: the important distinction within production between value creation and capital consumption. The story of China�s economic development is to a great extent one of unsustainable, centrally planned growth specifically in terms of GDP � but a lack of sustainable value creation, capital accumulation, and entrepreneurship. In conclusion, while my wish is to see the Venezuelan people be rid of the vile Maduro government as quickly as possible, the country is haunted far more by its continued loyalty to socialism than it is the actions of a particular government leader. While the realities of modern Venezuela � combined with the global ambitions of China � could make a deal between the two countries a logical outcome, the Chinese model is not one that will bring prolonged prosperity. True hope for Venezuela, and the rest of Latin America, must come from rejecting the inevitable failures of Marxism and embracing a Misesian understanding of economics and classical liberalism. In other words, Menos Marx, Mas Mises. Killings by security forces rife in Venezuela, rule of law 'virtually absent': U.N.
Higher oil prices won't save Venezuela. Venezuela was one of the richest countries in South America - when oil was $18 a barrel. The price of oil is not what's wrong with Venezuela. ... Now that crude prices are rising again, the political and economic pressures are easing on oil exporters as revenues, in most cases, begin to surge. But there is one glaring exception, one country that relies on oil exports for essentially all its export revenue and whose economy is continuing its downward spiral despite the sharp rise in oil prices: Venezuela. The simplest way to gauge the impact of oil price fluctuations on the economy and the potential effect on policy is to look at an exporter’s fiscal break-even price. The break-even price is the level at which oil prices need to sell in order to allow an exporter to meet government spending and produce a balanced budget. When crude prices fall below break-even, budget deficits start to balloon, eroding reserves and threatening economic stability. Depending on the availability of other exports and the size of reserves, large gaps between break-even and market prices can force a government to cut spending, raise taxes and borrow heavily. It can squeeze an economy well beyond the oil industry. The most dramatic response to the drop in global oil prices came in Saudi Arabia, where an ambitious and daring crown prince, Mohammed bin Salman, launched revolutionary reforms with an eye toward, among other things, reducing the country’s overreliance on oil. While the success of many of his reform plans remains unclear, the crown prince’s efforts to lower Saudi Arabia’s break-even price has been little short of spectacular. Before prices fell, Saudi Arabia’s break-even price was $105.70 per barrel. The government has since slashed expenditures by about one-fifth, cutting subsidies and other expenses, and raising taxes. The break-even level now stands at $74.40, and a recent study by a Japanese bank predicts it will reach $55 a barrel by 2021, giving the kingdom ample room to finance Crown Prince Mohammed’s goal of diversifying the economy. Other Gulf states have also moved to narrow the gap, introducing a value-added tax, lowering subsidy payments and promoting new industries. Now, with oil prices climbing, these petroleum producers are set to reap a sharp rise in revenues against a lowered level of national expenditures. The contrast with Venezuela could not be starker. Despite the rise in prices, Venezuela, holder of the world’s largest known oil reserves, is seeing its oil income continue to plummet, along with the rest of its economy. Venezuela's inflation rate could reach ONE MILLION PERCENT by the end of the year. And that, folks, is hyper-inflation. What does an inflation rate like that even mean? If you can buy a candy bar for a dollar now, ONE HOUR FROM NOW it will cost $2.15. Last edited by airforce; 07/25/2018 02:25 PM. Venezuela removes zeros from currency to slash inflation. Yes, you read that right. That should cure the 1,000,000% inflation in Venezuela. Venezuelan President Nicola Maduro took to television last week to announce his solution to the country's monetary woes: eliminating five zeros on all new Venezuelan bolivar bills. Sure, that's an unorthodox—some might say useless—attempt to combat hyperinflation, but the great Venezuelan experiment with socialism continues apace. At present, the highest denomination bill available is 100,000 bolivars. The new bills, set to hit the streets on August 20, will range from two to 500, with each unit representing 100,000 bolivars. To put that into perspective, as of last month, a cup of coffee in Venezuela cost 1 million bolivars. Maduro initially floated the idea of eliminating three zeros from bolivar bills in March, but didn't follow through—and four months later it's seemingly clear that hacking a mere three zeros off the currency won't solve anything. But five, ah, now you're getting somewhere. Hyperinflation has been a consistent problem in socialist Venezuela. Maduro's predecessor, President Hugo Chavez, enacted a similar policy in 2008, eliminating three zeros from the national currency. It did little to fight the underlying causes of Venezuela's inflation. Instead of trying the same silly plan again, Maduro must address the underlying problems leading to Venezuela's inflation if he has any real intention of alleviating the problems facing his country. With price and wage controls, and a largely centrally planned economy inherently incapable of meeting the needs of its populace despite being gifted with the largest oil reserves in the world, inflation in Venezuela is here to stay until people abandon the state-sponsored currency. Already in some parts of Venezuela, many people have turned to Bitcoin, derided as highly unstable in the developed world, for an alternate store of value to the overabundant bolivar. As Matt O'Brien noted on Thursday in The Washington Post, the International Monetary Fund increased its end of year projections for Venezuelan inflation from 12,875 percent to 1 million percent in just a few short months. On Tuesday, economist Daniel Mitchell examined the World Bank report that compared the Chilean and Venezuelan economies on his blog. Despite their similar histories and cultures, Chile abandoned the socialist experiment in 1973 while Venezuela embraced brutal economic collectivism 1999 under Chavez. The differences are astonishing. Chile has been blessed with enormous economic growth and some of the highest standards of living in South America while Venezuela lags behind with what the IMF has described as one of the worst economic crises in the last 60 years. Even as socialists in America assert that "Venezuela wasn't real socialism," the evidence to the contrary is clearer than ever. The number of zeros on the bolivar is a symptom; socialist central planning is the disease. Socialist countries eventually run out of everything except zeros. You can't make this stuff up. Venezuela just raised the minimum wage 3000%. Can you guess what happened? Yep. Workers are getting fired. President trump and other world lea...uaido as the new president of Venezuela. It's looking like a civil war is in the works. When Nicolás Maduro was sworn in for his second term as Venezuela's president earlier this month, the ceremony took place at the country's Supreme Court—rather than, as is typical, in front of the National Assembly. Five days earlier, when the Assembly opened its new session, opposition leader Juan Guaidó stood in front of his colleagues and accused Maduro of being a "dictator" and "usurper" who had used a fraudulent election to claim another six-year term as the nation's chief executive. In the days since Maduro's January 10 inauguration, things have moved quickly. The United States, Canada, and 17 Latin American countries signed a declaration refusing to recognize the legitimacy of Maduro's government. Some have cut off diplomatic ties with Venezuela. Those official actions have bolstered unofficial efforts to oppose Maduro in the streets of Caracas and other cities, where people impoverished by the Venezuelan regime's socialist policies have clashed with the military, which (along with the courts) remains loyal to Maduro. "The people of Venezuela have courageously spoken out against Maduro and his regime and demanded freedom and the rule of law," the White House said Wednesday in a brief statement. An op-ed from Vice President Mike Pence ran Tuesday in The Wall Street Journal, promising American support for the protestors—though, notably, Pence stopped short of saying exactly what form that support would take—and in a video message from the White House, Pence called Maduro a "dictator with no legitimate claim to power" and encouraged Venezuelans to support Guaidó. Clearly, a new phase in the long simmering Venezuelan crisis is beginning. Whether Maduro can cling to power likely depends on whether he can use the country's military to crush the current uprising—similar to what happened in 2017 when an anti-Maduro uprising was violently suppressed. Hopefully, the military will abandon Maduro. If it does not, the country may tip towards civil war. Make no mistake: Maduro is a monster, and Venezuelans are right to want to remove him from power. He sought to continue the socialist policies of his predecessor, Hugo Chavez, and has now brought those ideas to their inevitable conclusion. Chavez nationalized the Venezuelan oil companies and used the profits to fund a massive welfare state, but production declined (Venezuelan "peak oil" occurred in 1998, the year Chavez was elected) in the absence of competition and foreign investment. When oil revenues fell, threatening all aspects of the state-run economy, Chavez (who died in 2013) and Maduro printed money. When that didn't work, they instituted price controls. When inflation resulted, they closed off Venezuela to imported goods. Before long, what had once been the richest country in Latin America was reduced to a place where toilet paper is considered a luxury. An estimated 3 million Venezuelans have fled the country, turning the nation's collapse into a regional humanitarian crisis. If today's events are indeed a turning point for Venezuela, then the United States' role in the coming weeks and months is to continue doing what Trump and Pence did today. America should stand up for the right of Venezuelans to determine the direction of their country. But ultimately it must be Venezuelans who decide what happens next. In that regard, the Trump administration's response to the latest round of anti-Maduro uprisings has been admirable in its restraint. After all, it was Trump who suggested, in August 2017, that American military intervention could be used to "topple" the Maduro regime. In September 2018, White House officials met with Venezuelan ex-patriots to discuss the possibility of a U.S.-backed coup to overthrow Maduro. Ironically, both incidents served to only tighten Maduro's grip on power, as he was able to point to U.S. machinations as the source of Venezuelans' problems and distract, at least temporarily, from his role in the country's misery. An American-backed military coup in the style of the ones that toppled governments elsewhere in Latin America during the 1970s and 1980s would likely trigger endless internal conflict in Venezuela—and foment distrust towards whomever eventually replaces Maduro. Open war would, of course, be even worse. "There is no increase in the threat to U.S. security, which would be necessary to justify military action," Doug Bandow, a senior fellow at the libertarian Cato Institute, told Reason on Wednesday. Even as the humanitarian crisis deepens and Maduro's repressive political dictatorship becomes more obvious, Bandow says, American leaders should resist the urge to engage in a Latin American version of the nation-building failures of the past two decades. Instead, America should play a supportive role and allow Venezuela's neighbors to handle the political, economic, and humanitarian problems. That restraint will be tested if Maduro responds to Guaidó by unleashing the military against protesters—something that is already happening, according to some reports—or by arresting opposition leaders. Guaidó was arrested and held for two days by government intelligence forces last week. If something like that happens again, it would be easy for the Trump administration to use today's declaration that Guaidó is the legitimate leader of the country as the basis for direct action against the pro-Maduro military. Sen. Marco Rubio (R-Fla.) has already made that threat explicit. It should not have to come to that. Venezuela is a resource rich country with the potential to pull itself out of a decade-plus tailspin if the socialist thinking of the Maduro regime is finally excised. The United States also has an opportunity to show that it has learned a lesson from the decade-plus quagmire in the Middle East. Namely, that regime change is never as neat and tidy as it might appear at the outset, and that nation-building is best done by the people who will have to live there when the job is finished. Nicolas Maduro has just given U.S. diplomatic personnel 72 hours to get out. Things seem to be coming to a head. As the US does not recognize Maduro’s “regime,” his order for US diplomats to leave is not legitimate, Pompeo argued, adding that Washington will conduct diplomatic relations with Caracas solely through Guaido’s government. After the Trump administration recognized Guaido’s government, a number of US allies followed suit, including most of the OAS countries and Canada. EU leaders also endorsed the rebel government. Secretary of State Mike Pompeo has declared the regime of Venezuelan President Nicolas Maduro as illegitimate in a statement delivered to the United Nations Security Council. Pompeo blasted the incumbent’s regime as “criminally incompetent” in his Thursday address where he also said America is ready to provide $20 million in “humanitarian assistance” to Venezuelans. Pompeo’s speech echoed a State Department letter published Wednesday saying Maduro has no legal authority to break diplomatic relations. Around the world, lines are being drawn by nations over who they recognize as the leader of the collapsing nation, according to Conflict News. Correspondingly, without mentioning Maduro by name, Russia has warned the U.S. against military intervention in Venezuela. Most Democrats are behind Trump on his support for Juan Guaido. But not all of them. The hard left just can't let goof their support for Maduro and his disastrous socialism. Too long to post here, but well worth a read. Sadly, Rep. RoKahnna (D - CA) and Rep. Ilhan Omar (D - Minn), among others, won't read it. I posted all of these new happenings over at another site yesterday , thought that I would add them here so as to bring you all up to speed on the new "Syria" that we are about to get involved in . Putin Talks With Maduro And Warns U.S. This is what Venezuela needs to do right now. They won't, of course. But these simple steps would finally put them on the road to freedom and prosperity. And they would be a good idea for the U.S., too. 1. Open the road to monetary freedom, eliminating all legal tender laws and the nation's central-bank supported system of fractional-reserve banks. Allow Venezuelans to adopt whatever medium of exchange they wish. Even dollarization ought to be on the table. 2. Open the country to International Trade: eliminate all tariffs, taxes, and trade barriers. All of them. 3. Privatize Everything! All state-owned companies and assets, following Econintech's proposal (in Spanish). 4. Decentralize the Government: Grant total administrative and budgetary autonomy to Venezuela's twenty-three states . Decentralization is a key to minimizing the damage an abuse central government can do. 5. Lower taxes drastically, and decentralize tax collection and administration to the state level. All new taxes must be approved by referendum. 6. Allow private Venezuelans to access and accept both humanitarian and security assistance from foreign organizations. 7. Guarantee the right to self-defense: demobilize all the armed groups, purge the prisons, implement widespread private gun ownership, and auction to the public all weapons confiscated by the state. The UK, France, and Spain among a number of countries, have announced their recognition of Juan Guaido as Venezuela’s interim president after Caracas did not cave into an ultimatum calling for elections with eight days. On Sunday, Turkish Foreign Minister Mevlut Cavusoglu noted that “there is a spark that can turn into a fire at any moment” in Venezuela. The political crisis, Cavusoglu insisted, could only be resolved “through dialogue.” Without getting into specifics, the Turkish diplomat said that the crisis had been “fueled from the outside” – an act of foreign meddling that has “punished” the Venezuelan people. Soldiers from the Venezuelan national guard have left their posts ahead of an opposition-led effort to bring aid into the country, Colombia's migration agency said. The delivery of aid to the stricken country has proven to be a key area of contention between the two men who see themselves as Venezuela's leader. On the Venezuela-Colombia border, at least thirteen members of the security forces defected on Saturday, Colombia's migration authority said. "We are fathers and sons, we have had enough of so much uncertainty and injustice," they say. The BBC's Orla Guerin, at the Simon Bolívar International Bridge, said Venezuelans were begging soldiers to be allowed to cross. Mr Guaidó visited the Tienditas bridge on the Colombian side of the border, where he was accompanied by the country's president, Iván Duque. "We want to work!" people chanted as they faced riot police at the Ureña border bridge in south-west Venezuela. Activists there were joined by 300 members of the "Women in White" opposition group who marched in defiance of Mr Maduro's attempts to close the border. Meanwhile, a top ally of President Maduro has suggested the government would allow Venezuelans to accept aid "at their own risk", but that no foreign soldiers would "set foot" inside Venezuela. The president himself tweeted that "there will not be a war", posting pictures of cheering crowds in Caracas. "Take your hands off Venezuela, Donald Trump", he told crowds, accusing the US president of using aid as a means to invading the country. He accused Mr Guaidó of being a "puppet", and "American pawn", a "clown" and an "imperialist beggar." "Why are you serving a dictator?" It's been a difficult day here on the Venezuelan side. We found locals getting angry because they found the border was closed - these people normally make a living across the border. Then it turned ugly in Ureña. Mr Guaidó, who is the leader of the country's opposition-dominated National Assembly, last month declared himself the country's interim leader. He has since won the backing of dozens of nations, including the US. He has called the rule of President Nicolás Maduro constitutionally illegitimate, claiming that Mr Maduro's re-election in 2018 was marred by voting irregularities. Nicolas Maduro’s forces in Venezuela armed with tanks and live fire attacked an indigenous tribe armed only with bows and arrows in Venezuela when they tried to stop a convoy of humanitarian aid from Brazil. One woman from the Pemon tribe was killed and 15 were wounded, but the tribe took several soldiers, including three lieutenants and a sergeant captive. The battle took place in the remote Gran Sabana region near the Brazilian border. The Pemon were successful at stopping the anti-riot troops in their effort to block food and supplies from entering the country through Brazil near the village of Kumarakapay, about 50 miles north of the border. The soldiers tried to breach barricades set up by residents about 6 a.m., said Jorge Perez, mayor of the Gran Sabana municipality. Marcel Perez, a 30-year-old Pemon, said in an interview in Pacaraima, Brazil, that he and others had gathered at dawn for a peaceful protest to prevent the military from reaching the border. Five armored vehicles passed by, spewing tear gas that set fire to a small shack, the mayor said. Those wounded more seriously were allowed to cross on ambulances into Brazil so they could be treated in the regional center of Boa Vista. Perez said he was beaten with sticks a few hours later by members of a pro-Maduro gang while taking other wounded people to a hospital in Santa Elena de Uairen, on the Venezuelan side. Police said Zoraida Rodriguez, 45, was killed and 15 people were wounded. A Venezuelan general was negotiating with the tribe for the return of three lieutenants and a sergeant captured by the indigenous forces. Maduro says he is blocking aid shipments claiming they are a pretext for a U.S. intervention. President Donald Trump has said all options are open if Venezuela continues to block the supplies. Volunteers are preparing to don white clothing Saturday morning and walk across international bridges to bring food and medicine to their compatriots. Near Cucuta, Venezuelans streamed across border crossings on foot Friday under a scorching sun. Venezuelan socialist dictator Nicolas Maduro’s troops set U.S.-backed humanitarian aid trucks on fire, and demanded that President Trump abandon involvement in his country’s affairs. The humanitarian aid trucks, led by interim president Juan Guaido, were set ablaze Saturday trying to enter Venezuela from Colombia. Maduro severed diplomatic ties with Colombia after its president Ivan Duque declared support for the United States’ recognition of Guaido as leader of Venezuela. Colombian soldiers have been deployed near at the border as tensions continue to escalate. Guaido condemned the destruction of the much-needed aid, but assured supporters that humanitarian trucks were still making their way across the Venezuelan border. “We continue to receive the support of the international community, which has seen, with its own eyes, how the usurping regime violates the Geneva Protocol, where it is clearly said that destroying humanitarian aid is a crime against humanity,” he tweeted. Trump offered words of encouragement on Twitter Saturday to the Venezuelan people suffering under Maduro’s socialist regime. National Security Advisor John Bolton also called on nations who still recognize Maduro as president to reconsider their support. “Masked thugs, civilians killed by live rounds, and the burning of trucks carrying badly-needed food and medicine. This has been Maduro’s response to peaceful efforts to help Venezuelans. Countries that still recognize Maduro should take note of what they are endorsing,” he said. I get the feeling Maduro would be willing to leave - if someone would offer him safe passage and sanctuary somewhere. The problem is, his two man supporters, Russia and China, probably don't want to have anything to do with him right now. I'm surprised his army has stayed loyal this long. His generals must be afraid of something. I had a feeling this was coming. Maybe some people in government will wise up and realize that "regime change" in Libya didn't exactly turn out as planned, and it's not likely to in Venezuela either. But I wouldn't bet on it. Ron Paul has a question: Just who burned that aid truck? The video doesn't answer the question conclusively, but it sure looks like it might have been the protesters. A false flag? Could be. Venezuelan opposition leader Juan Guaido is blaming Socialist President Nicolas Maduro for the nation’s blackout while calling for his supporters to rally in Caracas. “The right-wing, together with the empire, has stabbed the electricity system, and we are trying to cure it soon,” said Maduro. The crisis escalated January 23rd when Guaidó invoked the nation’s constitution and declared himself interim president, he’s been at fierce odds with Maduro since. CARACAS, March 9 (Reuters) - Venezuelan opposition leader Juan Guaido on Saturday called on citizens nationwide to travel to the capital Caracas for a protest against socialist President Nicolas Maduro, as the country's worst blackout in decades dragged on for a third day. The power flickered on and off in parts of Caracas on Saturday morning, including the presidential palace of Miraflores, according to Reuters witnesses. Six of the country's 23 states still lacked power as of Saturday afternoon, Socialist Party Vice President Diosdado Cabello said on state television. "We're all upset that we've got no power, no phone service, no water and they want to block us," said Rossmary Nascimiento, 45, a nutritionist at the Caracas rally. "I want a normal country." At a competing march organized by the Socialist Party to protest what it calls U.S. imperialism, Maduro blamed the outages on "electromagnetic and cyber attacks directed from abroad by the empire." "The right wing, together with the empire, has stabbed the electricity system, and we are trying to cure it soon," he said. Several hundred people gathered at the rally in central Caracas for a march to denounce the crippling U.S. oil sanctions aimed at cutting off the Maduro government's funding sources. "We're here, we're mobilized, because we're not going to let the gringos take over," said Elbadina Gomez, 76, who works for an activist group linked to the Socialist Party. "We're not offering services and we don't have any patients staying here because the generator is not working," said Chiquinquira Caldera, head of administration at the San Lucas clinic in the city of Maracaibo, as she played a game of Chinese checkers with doctors who were waiting for power to return. Maduro says Guaido is a puppet of Washington and dismisses his claim to the presidency as an effort by the administration of U.S. President Donald Trump to control Venezuela's oil wealth. Former mayor and exiled opposition activist Antonio Ledezma on Saturday called on Guaido to seek United Nations intervention in Venezuela by invoking a principle known as "responsibility to protect." "President @jguaido, (you should) formally request Humanitarian Intervention, applying the concept of R2P, to stop extermination, genocide and destruction of what's left of our country," Ledezma wrote via Twitter. At the opposition rally, Guaido said he would not invoke an article of the Venezuelan constitution allowing the congress to authorize foreign military operations within Venezuela "until we have to." "Article 187 when the time comes," Guaido said. "We need to be in the streets, mobilized. It depends on us, not on anybody else." Trump has said that a "military option" is on the table with regard to Venezuela, but Latin American neighbors have emphatically opposed a U.S. intervention as a way of addressing the situation. “This is going to end ugly. It’s going to be ugly at the end,” designer Nela Garcia told an NPR reporter over the weekend. As Venezuela fell into darkness following an already tumultuous period of starvation and unrest, many thought things couldn’t get any worse. So bad, in fact, that local water systems are no longer functioning, which means in addition to a lack of food and medicines, the people of socialist Venezuela are now struggling to gain access to potable water. With the economy in shambles, the US dollar coming under threat from China and Russia, and tens of trillions of dollars in unsustainable debt obligations, the United States could soon collapse in a similar style. When it happens, most people will be shocked and unable to deal with the situation. Prepare yourself and your family accordingly, because as you can see from the example above, support from your local government is nowhere to be found. Venezuela is a country on the edge of total anarchy. The looting started last Saturday afternoon after an ice company, on a hot day, demanded that it be paid in dollars. A crowd instead tore through its factory and then continued onto nearby pharmacies and stores. By the evening, the entire city was taken over by people seeking out life’s necessities by any means necessary. The country’s blackout took an already flammable situation and threw a match on it. Maduro’s handling of the situation has prompted the U.S. and other nations to instead recognize opposition leader Juan Guaido as the rightful head of state. Maduro has concentrated his power, in the form of resources and troops, in Caracas, the country’s capital. But the recent chaos in Maracaibo, a city of 1.6 million, shows the rest of the country is in tumult and not even the largest cities are safe. When power was restored, many transformers and substations wound up bursting into flames. There were long lines of people at water trucks, streams and burst pipes. As far as protection, “a single municipal squad car was seen” during a day of looting in the city – and the officers within warned that “no protection” was on its way. “Everyone knows that working here means working in anarchy, that anything can happen to you at any moment,” one local watchman said while watching his store disintegrate in front of him. This is a street in Caracas. 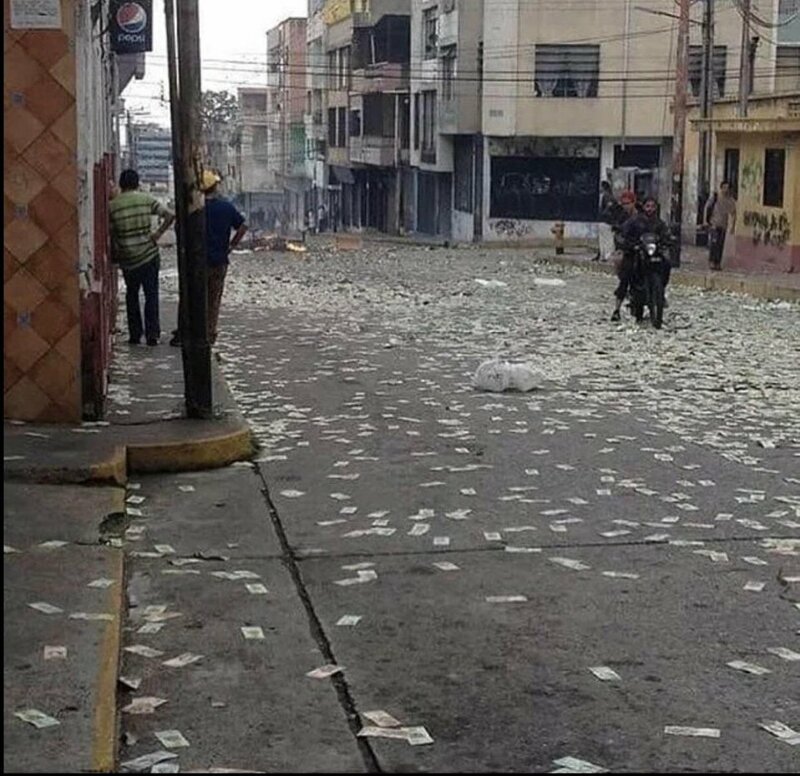 The trash in the street is Venezuelan paper money, worth so little it's not worth picking up. I remember talking with my landlady in Erlensee, Germany, many years ago. As a little girl in the 1920's she remembered her father going out to buy some firewood for the furnace - and realizing it would be cheaper just to burn the banknotes in the furnace.